This entry was posted in Plants & the Northern Kingdom - Israel and tagged Bible, Bible Garden, Bible Plants, Bible Study, Bible Symbolism: Renewal, broom tree, Christian walk, christianity, Elijah, Garden, Gardener, God, God as a Gardener, Israel, Israelites, Old Testament, Plant Symbolism: Renewal, plants, Prophet, Renewal, Retana raetam, spirituality. Bookmark the permalink. Thanks for this! 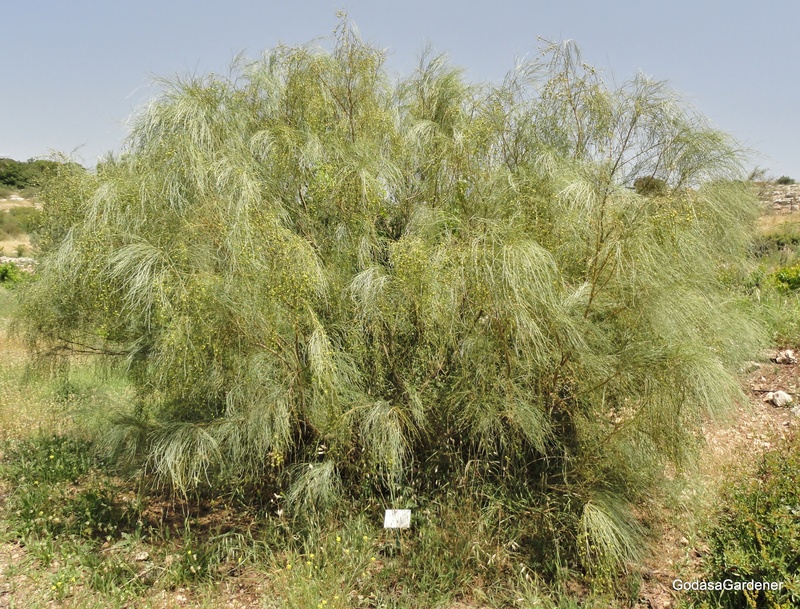 I was just curious about what the broom tree looked like when I stumbled upon this article, and it has given me much more to think about when it comes to this plant than just it’s looks! Jase, Thank you for liking my blog on plants. I love the topic. If you have the chance visit my website http://www.CarolynRothMinisty.com. You can see the two books I have written on Bible plants. I live in Roanoke Virginia and at church we have a Bible garden. I have studied in Israel. Hi, I just want to remind you that the mention of the broom tree in Job 30:4 does NOT refer to its branches and roots being used as firewood. Rather, it is saying that the roots (along with other desert plants) are eaten by (social?) outcasts that have escaped to the desert. The mention is “They pull up salt plants in the desert and eat the roots from the broom tree”, from the Easy-to-Read Version (ERV). Hope this helps. In Job 30:4, the plant was not a broom tree but the Atriplex halimus according to most Israeli botanists. The broom tree was the tree Elijah rested under. Blessings. I was so blessed and encouraged by your insights into the broom tree. David, it sounds like you may have had an Elijah day; one that should have been a victory but turned into anything but. I’ve had those days and when I do, I remember that God was with Elijah during them. Pastor, you may want to also check my other site: http://www.obscurecharacters.com. Blessings. That’s a wonderful insight from your post,I ve really been put through on the symbolism of broom tree.the broom tree in East Africa is different from that which you talked about. Today’s gospel was this same passage about Elijah. This is describing me. My mom passed away last year suddenly and I am so broken. I try not to show it anymore but my heart is truly broken. Her death caused me to question my faith. My mind knows God/Jesus exists but my heart is arguing that He doesn’t because of the way she died. I never feel her around me as many say they do after a loved one dies. I feel empty and that she’s just gone. I decided that I would take a deeper look into my religion and see if I couldn’t get some hope back. It’s taking a long time and with the help of my mom’s best friend I’m trying really hard to understand and trust God and not give up. I feel like I’m like Elijah. God keeps telling me to get up and eat. Keep going. I had my doubts after my mom’s death if God even existed. But as I look around my world I ask myself “Can all these people be wrong and I am right? Or are all of these people right and I’m wrong?” I believe I’m wrong. Hello, I hope you are feeling better now. now, but there are more resources now. scripture to comfort you whenever you feel down. Loved reading this……thank you. The broom tree was mentioned in An Introduction to Solitude and Silence…….a book I am reading. I was so curious to find out more about the tree. If I can’t find a broom tree here, I might just have to get an old fashioned broom……for display….Lol…….to remind me God renews continually……..